bought for guest room. love the color and quality. Indulge yourself in spa-like luxury with the Palisades 8-Piece Embroidered Comforter Set. The polyester filling gives just the right fluffiness to this comforter set while the bar tacking details give a more formal finished look. Our luxuriously silky brushed microfiber material is constructed using techniques that include better stitching, stronger weaving, and softer materials; Ensuring a durable and soft touch. Fashion meets luxury with this set and is the perfect solution to your decorative and comfort needs. Care Instructions: Machine washable and dryer safe. Recommended - Machine wash gentle cycle with cold water. Sun dry or low tumble dry. The comforter set is pretty, but it's not as impressive in person as it is in the picture. Pros: 1. 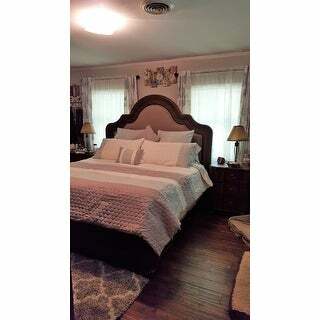 It looks nice and the colors in the picture are true to the actual colors of the comforter set. 2. It came with all of the listed components. Cons: 1. The pillow cases are HUGE. My pillows swim around in them and look ridiculous. 2. The blue pillow cases had several small reddish-brown stains on the backs. 3. The comforter is thin and not very warm. I live in a warm climate and it works well temperature-wise, but the comforter is quite thin and the filling is lumpy and sparse, so I would not recommend for use in cold weather. 4. The top 1/3 of the comforter is plain cream-colored. You can't tell from the picture because it is folded. You would assume from how it looks in the picture that the entire comforter is striped with blue and gray and cream, but a major chunk of it at the top is just the cream color. 5. It doesn't appear to be very good quality, so I'm not sure how long it will last. There are stray threads hanging off all over the comforter, and the fabric is so thin and low-quality that it feels like it's going to rip if you tug it too hard. I am holding this bedroom set until spring time to use, as the colors are so soft and supple. Also because, with the extra winter bedding now in use, the comforter would likely not cover the sides of the mattress. This comforter is 106 inches wide...although described as "oversized", it is 4 inches smaller than my current comforter. A good buy for all the pieces you receive. A tip for those of you who think comforters come out the bag ready to use...they do need ironing. But, I always iron the comforter ON THE BED. It is so easy to do and you don't have to keep moving it over the ironing board. Of course, all the other pieces get ironed in the usual manner. Just be careful of the heat setting. Beautiful but a little bit too short. I love the colors and the style of this comforter set! But it's not quite long enough to cover the whole mattress at the foot of the bed. I have it pulled back about 6 inches at the top just to cover the mattress. Other than that it's absolutely amazing I love it. My mattress is not overly thick. I think it's normal by today standards. Love the feel of the comforter. Super soft and light, while also giving warmth and comfort. Color is exactly as pictured. I was concerned because description labeled it blue/grey, but picture showed a seafoam or light green/blue (which is what i was looking for). 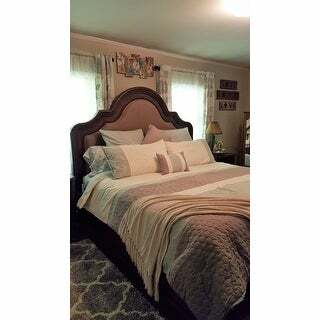 I had purchased the "Burwell" set a couple years ago and the colors match up well with decor pillows and Shams in that set. Great for interchanging pieces for many different looks. A small change, feeling of something different, without actually changing color scheme or entire feel! Very happy with decision to choose this set. High quality feel as with the Burwell set. A good nights sleep awaits! Although I like the set, it's definitely not worth the price I paid. IMO, it's worth no more than $40. It's poorly made. Strings hanging off and it just arrived. I'm not saying don't buy it. What I'm saying is it's not worth 70 dollars! I also need to go buy bigger pillows now. Painting our bedroom Sherwin Williams "Rainwashed" called for a new comforter set, and this set had the right colors to match both that pale seafoam blue and the brown in our carpet. It's soft - not just the filling, but the material itself. Yet durable enough that our cocker spaniel hasn't damaged it by jumping up on it and sleeping there every night. The bed skirt is more gray than tan, so I'm not using it. The shams are nice. I'd definitely buy it again. I love the comforter set. The colors are pretty and it's light weight. I bought it for use during the summer months and it's perfect! This is a pretty color however it is made very poorly. It looks like something I could sew together and I don't sew. A lot of extra backing and the filling inside does not go to the edges so all around there is a lot of extra material that makes it feel and look awkward. Love this! So cute and nice and cool for the summer months in Napa. nice addition for a bed set. Very pretty and cool looking for summer. It is more "mint green" than blue and just what I was hoping for!!!!! Just love it! Perfect, good materials, fit my bed nicely. It is more thin than I would prefer. Also it is a sage green. I love the color. It is so spring/summer looking. I love this comforter so much. It's light and soft. Perfect for spring and summer. Colors are exactly what the picture shows. I love this comforter set, everytime I enter my Master Bedroom ,I think I'm at someone's beach house. I'm glad I tried something outside my Normal Pattern. I recommend it to anyone who wants a change. Beautiful and comfy. Adds a nice seaside, calming touch to our bedroom. "In the reviews I keep reading that its more gray than beige... Needing beige tones in my bedroom, as my rug is brown, is this true?" "What are all the colors in this collection? " It is shades of aqua and grey. "Is the green more sage or mint?" It's a muted aqua color, more mint than sage. "What is the reverse color of the comforter?" The reverse side is the aqua color. "Does this or any other comforter sets in gray/teal combo come with matching curtains/drapes?" I'm sorry I couldn't find that we have any sets in those colors at this time that come with curtains. "Hello, I was wondering what is the GSM count on the comforter? Thank you"
Hello marocha65, these comforters are made of 100 percent microfiber polyester with 85 GSM. Thank you for shopping with us! "Is this a warm conforter? Good for winter? It doesn't look so warm." Hello juan, we can appreciate the fact you want a firsthand account of the product. You will receive an email notification every time you get a response. Thank you for shopping with us. In my opinion, not a cold weather comforter. Quite thin, with not much filling. No, it's not very warm. I just received this comforter and it's very thin and doesn't have very much filling inside. I don't think it would be good for winter.